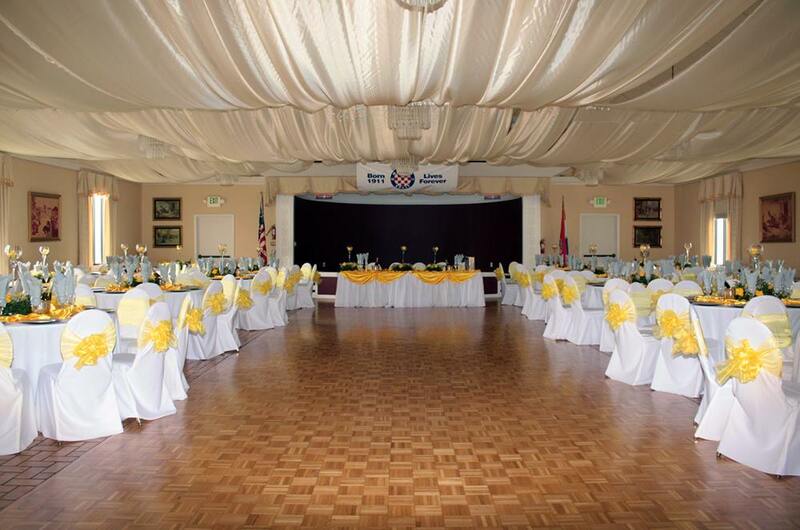 Croatian American Hall in San Pedro is an excellent venue for wedding ceremonies and wedding receptions, anniversary parties, business meetings, concerts, annual dinners, banquets and other celebrations. For Rates and Policies, please contact our office at 1.310.547.9484 from 9:00 A.M. to 1:00 P.M. Monday - Friday. The Croatian-American Club features a 600 square foot lounge with a full bar and a 2,500 square foot ballroom/dance floor, which also doubles as a dining room. Set into the back wall of the ballroom is a 180 square foot elevated stage. The ceilings are 12 feet high. Sconce lights, dimming chandeliers, and a slowly spinning mirror ball help set the mood. We have a wheelchair accessible entrance and restrooms. We have 15 six-foot diameter round tables, 4 six-feet long banquet tables and 250 chairs. All tables and chairs are available for use and are included in the rental fee. The stage is equipped with 4 outlets totaling 75 amps. There are 2 outlets at the entrance to the main hall totaling 25 amps. The bar has 3 outlets totaling 50 amps. We have a fully equipped industrial kitchen with 2 ovens, 2 convection ovens, 2 large refrigerators, one large freezer, pots, pans, and cooking utensils. Also included in the kitchen rental is 250 + of each of the following: plates, salad forks, dinner forks, spoons, butter knives, steak knives, water goblets, wine glasses, and champagne glasses. Provided by Croatian American Club. Number of officers as needed. Please visit or call our office for rental fee information. Everybody is welcome to all our activities at the club! Lunches at the club – We serve fabulous lunches every Wednesday, NOON – 2:00 P.M.. Donation is $10.00. Morning hours at the club – We are open every Monday through Friday 9 A.M. - 1:00pm. During those hours we also serve coffee, cappuccino, and espresso. Tombula – Every Wednesday evening at 7:00 P.M. and every Friday at 8:00 P.M.
Bingo – Every Sunday afternoon at 3:00 P.M..
Cards playing - Every Tuesday and Thursday evening at 8:00 P.M. Membership dues - $50.00 per person. Members have privilege of renting our hall with discount.